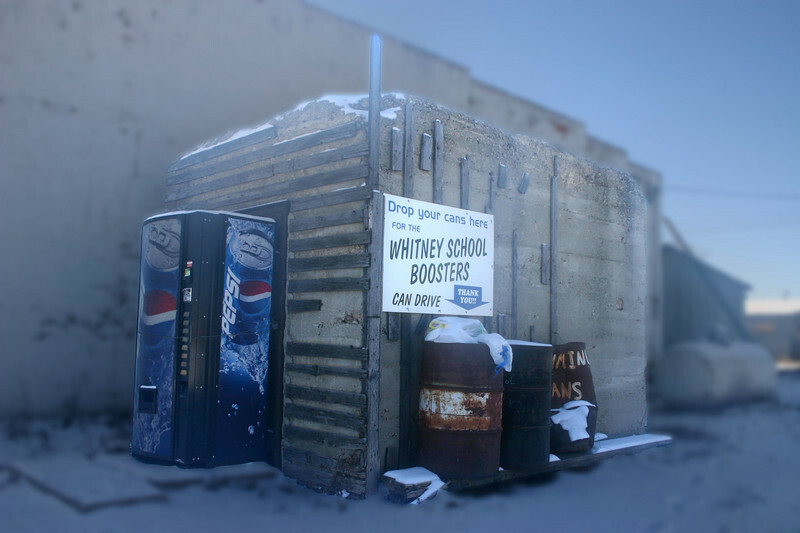 Bob Lemmon remembers Whitney, Nebraska, when it was a "hopping" place. A few of his memories are shared here. 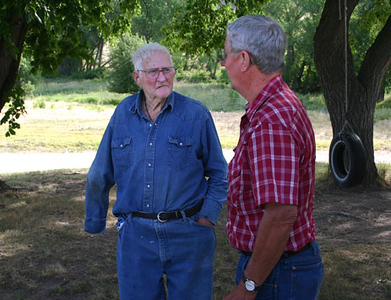 On July 7, 2007, long-time Whitney area resident Bob Lemmon (left) spent an hour or so visiting with Bob Galey (right) and Larry Miller about days gone by. Bob's ancestors came to the United States from Ireland. They eventually settled in northwest Nebraska. His mother and father were married shortly after the turn of the century, and his mother (Anna Neece Lemmon) completed her education at the old Normal School in Chadron before becoming a teacher and then raising her family. 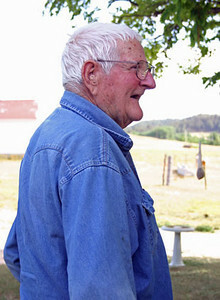 Bob attended the Whitney School and graduated in 1931. Within three weeks, he went Pine Ridge in South Dakota, where his father had leased 90 sections of land for 5 cents an acre. They started with 800 head of cattle and returned six years later with 2,800 head. Bob Lemmon remembers downtown Whitney as a busy place, with a restaurant, hotel, two banks, a drugstore, two grocery stores, a movie theatre and a lumber yard. He was 12 years old when fire ravaged the west side of Main street in 1927. Modern residents have become almost oblivious to one of the business “landmarks” of old downtown Whitney. It’s the safe of the Farmers & Drovers Bank that burned down in 1927. Now something of a one-stop recycling center (buy your pop and deposit the empty can in the recycle can!) it’s been a subject of some interest for years. We know the safe was opened at least once in recent years -- but what were its contents? Help us solve the mystery. E-mail us with what you know about it. This photo was taken in November 2007. Bob Lemmon remembers well that a foreign language was required at Whitney School. He and a few of the students were particularly disadvantaged, because many of their classmates were from German-Russian families that settled in Whitney. "It was awful for those of us who couldn't speak German." He recalled taking grade school classes in the east end of the school and later high school classes in the west end. A low-ceiling gym was in the basement, posing a real challenge to visiting basketball teams. Most popular, remembers Lemmon, were summertime baseball games played on a field west of the school. "Us kids would choose up sides and play a couple of innings before the adults would play their game. Women would bring picnic baskets, and it was a real affair." "Whitney kind of blew themselves up," said Lemmon, because the town just didn't have much recreation for the many people working to build Whitney Lake. "Whitney wouldn't let them have a pool hall," although they did provide dancing at the Woodmen Hall, which also was home to the county's first motion picture theatre. Woodmen Hall was just across the alley, west of where the Methodist Church is today. He recalls many entertainers performing in the hall and remembers, too, the "Merrymakers," people who were voted into membership and received a card, allowing them entrance to the hall. 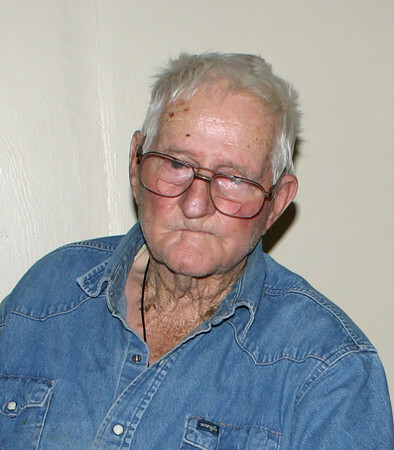 Bob Lemmon's family was steeped in ranching experience. His grandfather was a blacksmith, shodding horses in Deadwood during the winter and working the family homestead in Nebraska during the summer. His father worked as a cowboy in Wyoming and Nebraska. He had a livery barn near what was most recently the Hudson Auto store in Crawford. Soon thereafter, he entered into an arrangement that was to become the Ivans-Lemmons operation. Essentially, the Ivins' provided the land, and the Lemmons provided the labor. It was a partnership that spanned more than half a century. "Whitney was one of the biggest stock shipping points between Cheyenne and Omaha," recalls Lemmon. He remembered between 30-40 rail cars full of livestock leaving the Whitney-Chadron area, steaming straight through to Omaha without a stop. 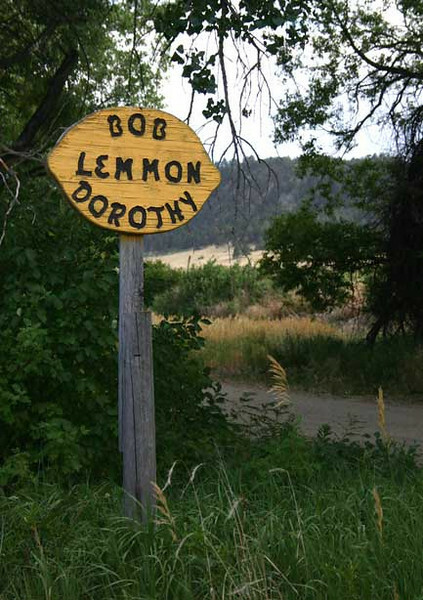 Widowed and weathered -- but still quite spry -- Bob Lemmon lives on a place in the timbered hills south of Crawford, not far from all the landmarks of his youth. Visit our Whitney Reflections website.